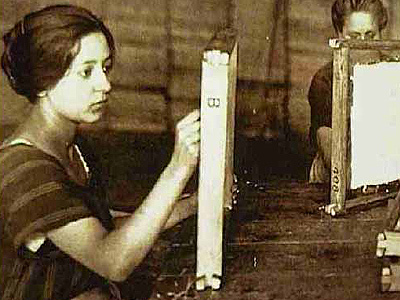 I realize that most people don’t know much about perfume making, but perfume making has a long history. To illustrate my point regarding why Naphtha is not a good solvent to make a cancer cure therapy, I’ll share with you a bit of the history of extracting botanicals and the science behind it. I’ve been making my own perfume since I was a little girl….. we’d go gather fragrant wildflowers and make lovely little blends… Think about the history of collecting a bouquet of flowers to take to a girl you favor… Our ancestors did things with purpose. A girl who would make a good wife would know how to take those flowers and create perfume with them… if you can extract perfume, you likely have some knowledge of plants and herbs. 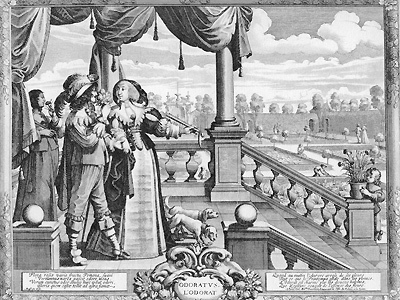 If you have knowledge of plants and herbs, you are likely a fair cook and a source of healing for any illnesses in the children, thus the way a maiden handled her bouquet could let the gentleman in question know how skilled a wife she may make. This post is an excerpt from article at the link. So just what are essential oils? what is their history? why do we make them? what are they good for? An essential oil is a concentrated hydrophobic liquid containing volatile aroma compounds from plants. Essential oils are also known as volatile oils, ethereal oils or aetherolea, or simply as the “oil of” the plant from which they were extracted, such as oil of clove. An oil is “essential” in the sense that it carries a distinctive scent, or essence, of the plant. Essential oils do not form a distinctive category for any medical, pharmacological, or culinary purpose. Essential oils are generally extracted by distillation. 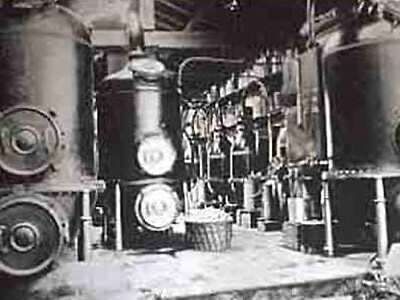 Steam distillation is often used. Other processes include expression or solvent extraction. They are used in perfumes, cosmetics, soaps and other products, for flavoring food and drink, and for adding scents to incense and household cleaning products. Various essential oils have been used medicinally at different periods in history. Medical applications proposed by those who sell medicinal oils range from skin treatments to remedies for cancer, and often are based solely on historical accounts of use of essential oils for these purposes. Claims for the efficacy of medical treatments and treatment of cancers in particular, are now subject to regulation in most countries. As the use of essential oils has declined in evidence-based medicine, one must consult older textbooks for much information on their use. Modern works are less inclined to generalize; rather than refer to “essential oils” as a class at all, they prefer to discuss specific compounds, such as methyl salicylate, rather than “oil of wintergreen”. The techniques and methods first used to produce essential oils were first mentioned by Ibn al-Baitar (1188–1248), an Andalusian physician, pharmacist and chemist. ncenses being infused with plant essences. The concentrated plant essences are extracted from leaves, seeds, bark or other plant elements by either distillation or cold pressing. The plant essences are then combined with what’s called a carrier oil and thus they become ‘essential oils’. Carrier oils are generally vegetable oils similar to the oils that we cook with except that are cold pressed to maintain their healing properties. Essential oils are used to promote healing in both the body and mind. They are found in many bath and body products as well as in candles and various other types of fragrance diffusers sold around the world. They may be inhaled, absorbed through the skin or ingested in food. When inhaled the oils are absorbed into the bloodstream, through the blood vessels in the lungs, and consequently circulated throughout the body. A few drops of essential oil may be added to a bath, massage oil, lotion, or candle to deliver their healing benefits. They are often used in fragrancers to disperse their scent more effectively over a period of time. Fragrancers diffuse the oil into the air through steam, mist, dry heat or evaporation (using a fan). In a pinch 3- 5 drops of an essential oil of your choosing in a cup of hot water will do.When shopping for essential oils the term “wildcrafted” pops up periodically. Wildcrafted plants are gathered from their natural, wild habitat and generally wildcrafting would entail taking only the small parts that are necessary so that the plant remains alive and flourishes. If the whole plant is needed then seeds are taken from the plant and replanted in the same area to maintain the balance. The following is a list of several essential oils and the ailments that they are used to treat. There are hundreds of different essential oils and each one has a number of healing properties. If you are interested in learning more there is a wealth of information on the Internet or you may also find information at your local health food store. Many health food stores have resource guides available to their customers. Basil – Bronchitis, Colds, Constipation, Insect Bites, Mental Fatigue, Migraine, Nervous Tension, Rheumatism, Sinus Congestion. The following is a list of conditions that it has been recommended the corresponding oils not be used under. If you have questions consult a medical herbalist. Use care when combining Clary Sage with alcohol. Essential oils have amazing healing abilities and when used properly they can be quite effective. To assure the most effective treatment as well as avoid any potential problems one should always seek out the advice of a qualified practitioner when using essential oils as with any other method of healing, holistic or otherwise. And now that we have a framework of the history of extracting essential oils, lets talk extraction methods commonly used to create these precious essences. 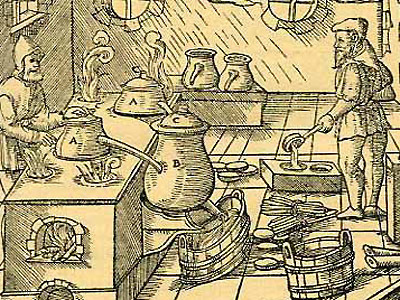 We owe a great debt to the Arabian alchemist (and physician) Ibn Sina – also known as Avicenna, who lived 980 – 1037 AD, since he was the first one to perfect steam distillation – and his process was so good that it stayed unchanged for a couple of hundred years. Distillation converts the volatile liquid (the essential oils) into a vapor and then condenses the vapor back into a liquid – it is the most popular, and cost effective method in use today in producing essential oils. The downside of distillation is the fact that heat is used in this extraction method, which makes it totally unacceptable for use on very fragile material, or where the oils are extracted with great difficulty. When this method of extraction is applied, great care has to be taken with the temperature and length of exposure of the heat to prevent damage to the oils. In the manufacture of essential oils using the method of water distillation, the botanic material is completely immersed in water and the still is brought to the boil. This method protects the oils so extracted to a certain degree since the surrounding water acts as a barrier to prevent it from overheating. When the condensed material cools down, the water and essential oil is separated and the oil decanted to be used as essential oil. The water that is so separated in this process is also used and is marketed as “floral waters” (also called hydrosol orsweet water) – such as rosewater, lavender water and orange water. Water distillation can be done at reduced pressure (under vacuum) to reduce the temperature to less than 100 degrees, which is beneficial in protecting the botanical material, as well as the essential oils. Neroli oil, which is sensitive to heat, can therefore be successfully extracted using this method. If extended exposure to hot water is not indicated for a particular plant – such as lavender, it is best to find an extraction method better suited. Any botanical material that contains high amounts of esters do not take well to this extraction method, since the extended exposure to hot water will start to break down the esters to the resultant alcohols and carboxylic acids. Steam distillation of essential oil manufacture. When steam distillation is used in the manufacture and extraction of essential oils, the botanical material is placed in a still and steam is forced over the material. The hot steam helps to release the aromatic molecules from the plant material since the steam forces open the pockets in which the oils are kept in the plant material. The molecules of these volatile oils then escape from the plant material and evaporate into the steam. The temperature of the steam needs to be carefully controlled – just enough to force the plant material to let go of the essential oil, yet not too hot as to burn the plant material or the essential oil. The steam which then contains the essential oil, is passed through a cooling system to condense the steam, which forms a liquid from which the essential oil and water is then separated. The steam is produced at greater pressure than the atmosphere and therefore boils at above 100 degrees Celsius which facilitates the removal of the essential oil from the plant material at a faster rate and in so doing prevents damage to the oil. Some oils, like Lavender is heat sensitive (thermolabile) and with this extraction method, the oil is not damaged and ingredients like linalyl acetate will not decompose to linalool and acetic acid. When essential oils are extracted using hydro diffusion it is a type of steam distillation, and only varies in the actual way in which the steam is introduced into the still. With hydro diffusion the steam is fed in from the top onto the botanical material instead of from the bottom as in normal steam distillation. The condensation of the oil containing steam mixture occurs below the area in which the botanical material is held in place by a grill. The main advantage of this method is that less steam is used, shorter processing time and a higher oil yield. When rose oil is extracted during water distillation, the one main constituent – phenyl ethyl alcohol – dissolves into the water of the distillation still and does not form part of the essential oil that is so extracted. The oil so extracted is therefore not whole, and is deficient in this rose-smelling ingredient – and in order to produce a “complete” oil, the phenyl ethyl alcohol needs to be distilled from the water in which it dissolved and added back to the “incomplete oil”. When this phenyl ethyl alcohol is so distilled, it is added back to the original distillate, in the correct proportion, to form a complete and whole rose oil, and is then called Rose Otto. When an essential oil contains any impurities, it can be purified by re-distillation – either in steam or in a vacuum, and this purification by re-distillation is referred to as rectification. An example of this is eucalyptus oil that is marketed as “double-distilled”. This is not the same as chemical or heat refining and is used to produce oil of standard quality. This process is basically a marriage between normal water distillation and that of steam distillation. The botanical material is immersed in water in a still, which has a heat source, plus live steam is fed into the water and botanical material mixture. When people talk about fractional distillation, it refers to a normal distillation process, but instead of the essential oil being collected continuously, it is collected in batches (the fractions that are referred to) and material normally so extracted isYlang-Ylang. When a “cold pressed” method is referred to in the manufacture of carrier oil and essential oils, it basically refers to the expression method, since no heat is involved in this method. 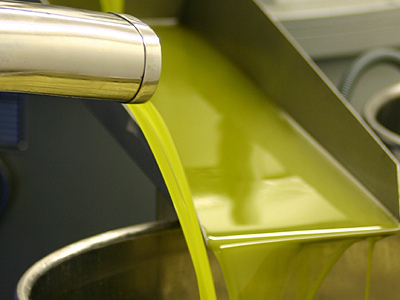 Most nut and seed oils are also extracted using a “cold pressed” method but here oil is forced from the material under high mechanical pressure and generally produces a good quality oil, but some manufacturers do impair this good quality by excessively refining the oil after extraction by means of chemicals or high heat. 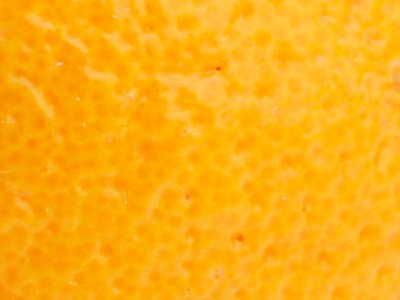 Most citrus essences are extracted by means of expression, and in the past were done by hand where the fruit pulp was removed, with the rind and pith then soaked in warm water to make the rind more pliable, since the pith of the fruit absorbed the water. After the fruit has absorbed the water and become more elastic, it was inverted which helped to rupture the oil cells and a sponge placed next to the rind. 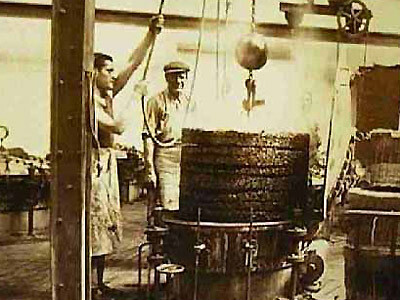 It was then squeezed to release the volatile oil, which was then collected directly into the sponge. As soon as the sponge became saturated with oil, it was squeezed and the essential oil collected in a vessel and then decanted. 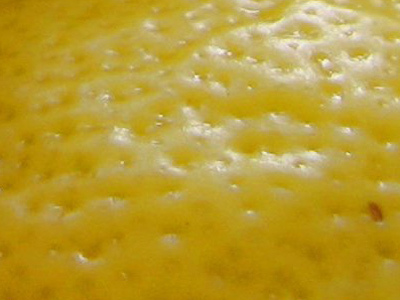 This form of expression extraction is used mainly to obtain citrus essential oils, and is a little less labor intensive than that of the sponge method. This more modern way of essential oil extraction is referred to as the écuelle à piquer process (direct translation = basin, to prick/stick/prod) where the fruit is placed in a device and rotated with spikes on the side puncturing the oil cells in the skin of the fruit. This cause the oil cells to rupture and the essential oil, and other material such as pigment, to run down to the center of the device, which contains a collection area. The liquid is thereafter separated and the oil is removed from the water-based parts of the mixture and decanted. This method of expression extraction is very much like the écuelle à piquer method, and is mostly used in the manufacture of citrus essential oils. With machine abrasion a machine strips off the outer peel, which is then removed by running water and is then fed into a centrifugal separator. The centrifugal separation is done extremely fast but it should be noted that due to the fact that the essential oil is combined with other cell content for some time, some alteration could occur due to enzymatic action. When we talk about the broad term of solvent extraction, it does not only refer to chemical solvents like hexane, but also to other forms – such as solid oil and fat as well as carbon dioxide. 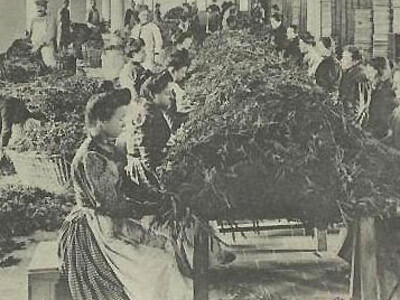 During this type of extraction, non-volatile components of the botanical material – such as waxes and pigments are also extracted and in some cases this is then removed during another process. With the maceration extraction method, the flowers are soaked in hot oil to have their cell membranes ruptured and the hot oil then absorbs the essence. The oil is then cleared of the botanical and decanted. This is very much the same technique used in solvent extractions, where solvents are used instead of the hot oil as used in maceration. Enfleurage could be compared to certain aspects employed in maceration, but is done in a slightly different way. 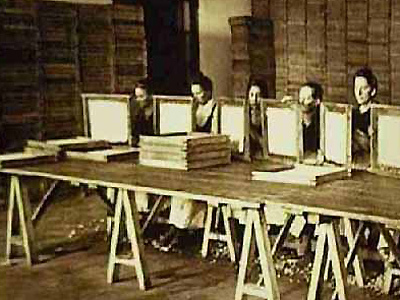 Glass plates in a frame (called a chassis) are covered with highly purified and odorless vegetable or animal fat and the petals of the botanical matter that are being extracted are spread across it and pressed in. The flowers are normally freshly picked before so encased in their fatty bed. The petals remain in this greasy compound for a few days or a couple of weeks (depending on the botanic material used) to allow the essence to disperse into the compound, where the then depleted petals are removed and replaced with a fresh harvest of petals. This process is repeated until the greasy mix is saturated with the essence, and needs to be repeated a couple of times until saturation is achieved. 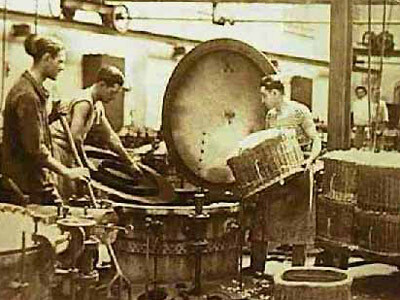 When the mix has reached saturation point the flowers are removed and the enfleurage pomade – the fat and fragrant oil – then washed with alcohol to separate the extract from the remaining fat, which is then used to make soap. As soon as the alcohol evaporates from the mixture you are left with the essential oil. This is a very labor-intensive way of extraction, and needless to say a very costly way to obtain essential oil and is nowadays only sometimes used to extract essential oil from tuberoses and jasmine. Essential oils can be extracted by using solvents such as petroleum ether, methanol, ethanol or hexane and is often used on fragile material such as jasmine, hyacinth, narcissus and tuberose, which would not be able to handle the heat of steam distillation. A solvent extracted essential oil is very concentrated and is very close to the natural fragrance of the material used. Although solvent extraction is used extensively, some people do not believe that it should be used for aromatherapy oils since a residue of solvent could be present in the finished product. Some reports site a solvent residue of 6 – 20% still present in the finished extraction, but this was normally the case when benzene was the standard solvent used. With hexane (a hydrocarbon) as the solvent material the solvent residue goes down to about 10 ppm (parts per million) and this is a extremely low concentration of solvent in the resultant product. As mentioned, benzene is no longer used in the extraction method, since it is regarded as carcinogenic (cancer forming). After the plant material has been treated with the solvent, it produces a waxy aromatic compound referred to as a “concrete“. The use of hypercritical carbon dioxide extraction is a fairly new way to extract essential oils from botanical material and although a bit on the expensive side, does yield good quality oils. 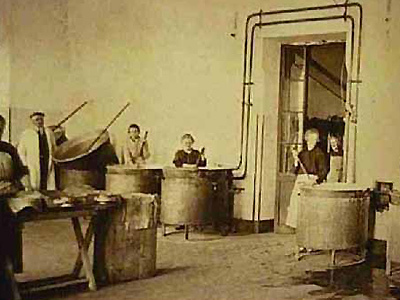 Carbon dioxide becomes hypercritical at 33 degrees Celsius, which is a state in which it is not really gas or liquid, but has qualities of both, and is an excellent solvent to use in the extraction of essential oils since the low temperature required and the fact that the process is near to instantaneous. The carbon dioxide is furthermore inert and therefore does not chemically interact with the essence that is being extracted. To remove the carbon dioxide solvent, you simply need to remove the pressure under which it is kept. 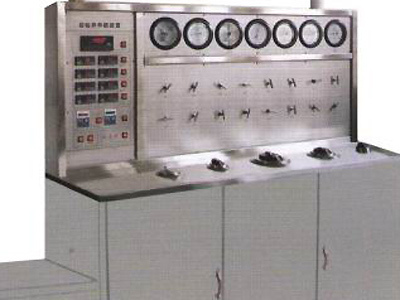 This process has to take place in a closed chamber for the hypercritical pressure required for carbon dioxide is 200 atmospheres – that is 200 times the pressure of normal atmosphere. To achieve this type of pressure some heavy-duty stainless steel equipment is required, and this is where high capital investment is required for this extraction method. Why is the art of perfume making important? Safety, purity of medications as well as spiritual use. Sula Benet (1903 – 1982), also known as Sara Benetowa, was a Polish anthropologist of the 20th century who studied Polish and Judaic customs and traditions. Born in Poland, Benet was fascinated with peasant culture of Poland since her early youth. This interest eventually led her to enroll as a student of literature and philosophy in the Faculty of Humanities in the University of Warsaw but graduated with a degree in anthropology. Upon receiving her degree in 1935, she attended graduate school at Columbia University, where she received her doctorate in 1944. The Hebrew term kaneh (קָנֶה) is the standard Hebrew word for “cane” or “reed,” occurring 62 times in the Masoretic text of the Hebrew Bible  It usually occurs without the adjective “sweet,” and is translated “reed,” though twice as calamus (Song of Songs 4:14 and Ezekiel 27:19 KJV). It occurs with the adjective “sweet” in three places (Exodus 30:22-33, Isaiah 43:24, Jeremiah 6:20), where kaneh bosm is typically translated as “calamus,” “sweet cane” or “fragrant cane” in English versions. ^ Encyclopedia Judaica. Volume 8. p. 323. 25 and make them into a holy anointing oil; blend it and perfume it as would an expert perfume-maker; it will be a holy anointing oil. Make these into a sacred anointing oil, a fragrant blend, the work of a perfumer. It will be the sacred anointing oil. Like a skilled incense maker, blend these ingredients to make a holy anointing oil. And you shall make of these a sacred anointing oil blended as by the perfumer; it shall be a holy anointing oil. “You shall make of these a holy anointing oil, a perfume mixture, the work of a perfumer; it shall be a holy anointing oil. Have a perfumer make these into a holy oil, a fragrant mixture, used only for anointing. This will be the holy oil used for anointing. And you shall make it an oil of holy anointing, an ointment compounded after the art of the perfumer: it shall be a holy anointing oil. And you shall make it an oil of holy ointment, an ointment compound after the are of the apothecary: it shall be an holy anointing oil. And thou shalt make it a holy anointing oil, a perfume compounded after the art of the perfumer: it shall be a holy anointing oil. and make of it an oil of holy ointment, a perfume of perfumery after the work of the perfumer: it shall be the holy anointing oil. and thou shalt make it an holy anointing oil, a perfume compounded after the art of the perfumer: it shall be an holy anointing oil. And thou shalt make it an oil of holy ointment, an ointment compound after the art of the apothecary: it shall be a holy anointing oil. You shall make it a holy anointing oil, a perfume compounded after the art of the perfumer: it shall be a holy anointing oil. and thou hast made it a holy anointing oil, a compound mixture, work of a compounder; it is a holy anointing oil. There is ABSOLUTELY no science behind this… the two types we see in this video are from two extraction methods…. the amber stuff is made from Naphtha. I’ve already made it plain why the petroleum distillate Naphtha is dangerous to use as a solvent in this blogpost. The deep green stuff is produced with alcohol. When you use alcohol as a solvent, you get chlorophyll in your oil. Chlorophyll is among the compounds known to treat and even prevent cancer. Rick is totally contradicting himself and many patients who have cured themselves with the dark green stuff. I’m not an old hippie, but I have sat at the feet of many old heads and respected their wisdom…. Any old head will remember the highly coveted “Jamaican Hash Oil” that always came dark green (perhaps with some red undertones) when it was spread out on a joint-paper. Any old head who remembers Jamaican Hash oil knows it has all the medicine necessary to have a very baked day. The same substance long coveted by recreational users is now being used to treat seriously ill people for a wide range of illnesses. What makes more sense to your mind? To use a petroleum distillate known to be dangerous that the government monitors heavily, or to use an alcohol solvent that is sustainable, easily recyclable, widely available, and with a long history alongside humans as a solvent to extract medicines? Sula Benet’s theory is not supported by academic or popular dictionaries of plants in the Hebrew Bible, which typically identify the plant as acorus calamus or cymbopogon citratus.